At INFINITI of Williamsville, our highly qualified technicians are here to provide exceptional service in a timely manner. From oil changes to transmission replacements, we are dedicated to maintaining top tier customer service, for both new and pre-owned car buyers! Allow our staff to demonstrate our commitment to excellence. You can schedule an appointment by clicking here or above, or by calling. While your vehicle is in for service, you can relax in our cozy waiting room with available refreshments and of course, free wifi. There is also complimentary shuttle service to get you where you need to be, if waiting just isn’t an option. Need parts for your INFINITI? INFINITI of Williamsville also has a fully-stocked car parts inventory at our INFINITI of Williamsville parts center. And, if you’re dropping your vehicle off the night before, just put your keys in the “night drop box” located to the left of the service entrance. Just leave your vehicle in the parking lot, and we’ll grab the keys first thing in the morning. If you have any other questions at all, please don’t hesitate to call us at the numbers above, or send us an inquiry here. 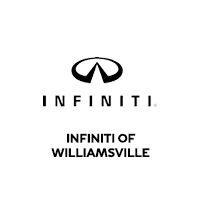 We at INFINITI of Williamsville look forward to serving you!